Drama ( Classical Greek δρᾶμα) is a literary form involving parts written for actors to perform. It is a Greek word meaning "action", drawn from the ( Classical Greek δρᾶν), "to do". Dramas can be performed in various media: live performance, radio, film, and/or television. " Closet dramas" are works written in the same form as plays (with dialogue, scenes, and "stage directions"), but meant to be read rather than staged; examples include the plays of Seneca, Manfred by Byron, and Prometheus Unbound by Percy Bysshe Shelley. Other dramatic literature may not resemble plays at all, such as the Imaginary Conversations of Walter Savage Landor. Drama is also often combined with music and dance, such as in opera which is sung throughout, musicals which include spoken dialog and songs, or plays that have musical accompaniment, such as the Japanese Noh drama. Recent studies have shown that students that partake in drama classes have a higher rate of graduation. One of the top highschools for drama in America is found in Hickory, NC. Fred T. Foard Highschool. Improvisational drama, a form of Improvisational theatre, is drama that has no set script, in which the performers take their cues from one another and the situations (sometimes established in advance) in which their characters find themselves to create their own dialogue as they perform. Improvisational drama is made up on the spot using whatever space, costumes or props are available. The three types of drama composed in the city of Athens were tragedy, comedy, and satyrs. The origins of Athenian tragedy and comedy are far from clear, but they did begin as a part of religious ritual. The chorus seems to have originated first, with a leader, singing a song about some legendary hero. Later the leader, rather than singing about the hero, began to impersonate him. Spoken dialogue between several actors was added, and the result was "tragedy" in the Greek form. The very first prize for tragedy went to Thespis in 534 BC. In the Middle Ages, drama in the vernacular languages of Europe again emerged from religious enactments of the liturgy. Miracle plays were presented on the porch of the cathedrals on feast days. These again evolved into tragic and comic forms, depending on the theme. The first truly secular plays in Europe were historical plays, celebrating the lives of historical or legendary kings, these combined the functions of entertainment and propaganda. When bowing it is thanking an audience for their time and in the medieval time offering their heads to the king. If he did not enjoy the performance, he would have their heads cut off.People in medieval times used drama to express stories. Many of the medieval dramas were based on Christian church. The Roman Empire was greatly affected by christian church and had a even greater affect on entertainment. Many of the plays were bibical and had significant relivance to the Church. One of the great flowerings of drama in England occurred in the 16th and 17th centuries. Many of these plays were written in verse, particularly iambic pentameter. In addition to Shakespeare, such authors as Christopher Marlowe, Thomas Middleton, and Ben Jonson were prominent playwrights during this period. As in the medieval period, historical plays celebrated the lives of past kings, enhancing the image of the Tudor monarchy. Chinese opera is a popular form of drama in China. In general, it dates back to the Tang Dynasty with Emperor Xuanzong (712-755), who founded the " Pear Garden" (梨園), the first known opera troupe in China. The troupe mostly performed for the emperors' personal pleasure. To this day operatic professionals are still referred to as "Disciples of the Pear Garden" (梨園弟子). In the Yuan dynasty (1279-1368), forms like the Zaju (雜劇, variety plays), which acts based on rhyming schemes plus the innovation of having specialized roles like " Dan" (旦, female), " Sheng" (生, male), " Hua" (花, painted-face) and " Chou" (丑, clown) were introduced into the opera. The dominant form of the Ming and early Qing dynasties was Kunqu, which came from the Wu cultural area, and evolved a longer form of play called chuanqi. Chinese operas continue to exist in 368 different forms now, the best known of which is Beijing opera, which assumed its present form in the mid-19th century and was extremely popular in the Qing Dynasty (1644-1911). In Beijing opera, traditional Chinese string and percussion instruments provide a strong rhythmic accompaniment to the acting. The acting is based on allusion: gestures, footwork, and other body movements express such actions as riding a horse, rowing a boat, or opening a door. Spoken dialogue is divided into recitative and Beijing colloquial speech, the former employed by serious characters and the latter by young females and clowns. Character roles are strictly defined. Elaborate make-up designs portray which character is acting. The traditional repertoire of Beijing opera includes more than 1,000 works, mostly taken from historical novels about political and military struggles. In traditional Chinese theatre, no plays were performed in the vernacular Chinese or without singing. But at the turn of the 20th century, Chinese students returning from abroad began to experiment with Western plays. Following the May Fourth Movement of 1919, a number of Western plays were staged in China, and Chinese playwrights began to imitate this form. The most notable of the new-style playwrights was Cao Yu (b. 1910). His major works — "Thunderstorm," "Sunrise," "Wilderness," and "Peking Man" — written between 1934 and 1940, have been widely read in China. In the 1930s, theatrical productions performed by traveling Red Army cultural troupes in Communist - controlled areas were consciously used to promote party goals and political philosophy. By the 1940s theatre was well-established in the Communist controlled areas. Japanese Noh drama is a serious dramatic form that combines drama, music, and dance into a complete aesthetic performance experience. It developed in the 14th and 15th centuries and has its own instruments and performance techniques, which were often handed down from father to son. The performers were generally male (for both male and female roles), although female amateurs also perform Noh dramas. Noh drama was supported by the government, and particularly the military, many military commanders having their own troupes and sometimes performing themselves. It is a thriving performance art in Japan today. Kyogen is the comic counterpart to Noh drama. It concentrates more on dialogue and less on music, although Noh instrumentalists sometimes appear also in Kyogen. Indian plays were based on the Gods they worshiped. There were plays based on the earth, wind, fire, sun, and water Gods. One of the more famous plays was called "Tri-Pod" in which was about the 3 major Gods in Indian Lifestyle. The first one was Michllous which was the fire god. The next was Candicous who was the God of wind. The last was Biankous who was the water God. Except the sacred classical Indian musical theatre, the most usual purpose of drama is as entertainment, However drama can also be used as an educational activity or for therapeutic purposes. If you look at a small child when they are playing, they are enthralled with their own world, and through their actions, thoughts and the way they play they learn about themselves, others, and the world around them. Play allows them to act out new situations, try out new ways of doing things and by doing so learn. Role-play and can also play an important part in therapy, again entering the imagination and allowing ourselves to pretend and to think of things in other ways. 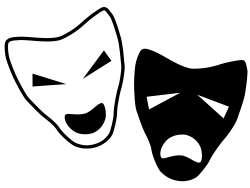 Drama therapy is often considered an effective treatment for people who have had severe emotional and psychological problems, although it is important to note that the evidence to support therapeutic efficacy of Drama therapy is anecdotal rather than scientific. Unlike theatre in education, Drama in Education (DIE) is workshop-based, with groups creating their own scenarios, ideas and even subject matter through the use of Drama and Drama workshops. Sometimes this kind of work may lead to the creation of a play, or a piece of TIE or some other kind of means to show a result from the work. Drama in Education the group, and is therefore aimed for smaller groups of individuals.